THE PISTORIO FOUNDATION TURNS 10! 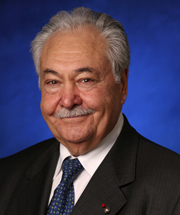 Ten years ago, as I retired from serving 25 years as CEO of STMicroelectronics, armed with a passion to improve our world, with a few resources from my retirement, and with many friends and former colleagues willing to join me, a new exciting chapter of my life began as I ventured assuredly into the world of philanthropy through the set up a not for profit organization to serve those who have no voice, the most vulnerable members of society, and yet who hold our future – the children of the world. My conviction was to bring efficiency and transparency to the sector, and make the greatest possible impact to improve the lives of children in need with the available resources. One decade on along this rewarding journey of learning and partaking in the joy of giving, our results speak for themselves: we have reached out to over 3500 underprivileged children providing access to school, basic health care and nutrition; nearly 400 students have successfully completed Professional School; 45 school and village infrastructure projects have been completed; and over 32 village communities and tens of thousands of indirect beneficiaries have been positively impacted by our actions. All this has been possible with a yearly average investment of only 500,000 CHF, with an average overhead spending of less than 4% of our budget, through careful and scrupulous project investment, leveraging on a significant network of committed volunteers worldwide, and devolving every dollar donated to our projects on location. The ripple effects and wealth created by new productive members of society, village families that have become self-sustainable, and projects that have improved health, sanitation and nutrition in villages, are immense. This incredible journey is the source of great joy when I witness the tangible and significant development that the villages we work with have achieved and that previously extremely poor children excluded from public school systems are now empowered with education and can proudly look forward to a brighter future. These results enforce our determination, with your continued support, to further broaden our reach. This year the Foundation celebrated ten years of existence and we’ve been excited to reflect on the rewarding achievements reached over this time: over 3,500 underprivileged children reached, 45 infrastructure projects completed, 398 students have completed their long term education culminating in Professional School, over 32 village communities impacted, and over 70,000 indirect beneficiaries have benefitted from our work. All this had been achieved with a spending of only 500,00 CHF per year, with overhead costs not surpassing 3.5% of budget on average per year, leveraging on the work of countless volunteers and of partner organizations worldwide. We celebrate our results and the work of tens of volunteers worldwide who have worked selflessly on the field as well as running our administrative and fundraising activities at our volunteer chapters. Likewise, we would like to thank our Board Members who have provided precious guidance, contributions in time and skills, and support throughout the years. Our motto “On the way to school, on the way to life” has been a dream come true for thousands of children and for our Foundation to witness, we did it! 2015 has been yet another year of very positive results for the Foundation’s projects and programs. Overall, we have continued to support the education of all our former students in need on scholarships programs. The number of growing success stories in terms of students completing their high school diplomas and families in communities coming out of poverty has strengthened our resolution to continue our work, our confirmation of the effectiveness of our holistic village approach and scholarship program, and our conviction in the power of education to transform lives and communities for the better. According to UNICEF, “children who are poor, have minimal education, lack vocational skills or have few prospects for job opportunities are most at risk of being trafficked.” With 1.2 million children trafficked yearly and 85 million forced into child labor (World Vision), empowering children with education also means helping to prevent inhuman forms of exploitation and abuse. Our mission is to improve the living conditions of children in the poorest communities and where there is the greatest need, with a focus on education. Since our founding, our non-profit organization has been able to extend scholarships to over 4,000 children and 398 students have completed a professional school diploma. Fully aware that the barriers to education are multidimensional, our Scholarship Program approach also ensures that every child gains access to quality education as well as to basic nutrition and basic health care. In addition, we are deeply convinced, as existing research studies confirm, that adolescence is a very critical age for underprivileged children and it is often the time when underprivileged students are most likely to abandon their studies: adolescents are twice as likely to be out of school than children under 12 years of age. Studies also show that obtaining a high school diploma and vocational or professional school diploma is key for a young person’s inclusion in society and to escape the traps of exploitation. Our focus is not only on literacy or primary school education, we strive to ensure that every child we support is able to continue through to high school and Professional School to be competitive in the job market with skills that are highly sought after in their country. Our Scholarship Program is the main component of our Village Approach. In addition, we also build and improve school infrastructure and maintain close relations with the schools we have built, constantly monitoring the level of education and the progress of students. Our schools are equipped with sanitation facilities, kitchen and canteens. In addition, we ensure that the school and village have access to clean drinking water. While our priority is enrolling all children of a village in school, we subsequently also promote villages’ sustainable development through the promotion of agricultural income generating activities and school gardens. Our ultimate goal is to work together with and empower communities to become self-sufficient so that families may support their own children’s education. The Foundation’s Flagship project is in Thailand, where we have completed over 30 infrastructure projects, served over 16 village communities and reached over 2,000 hill-tribe minority children since 2006. 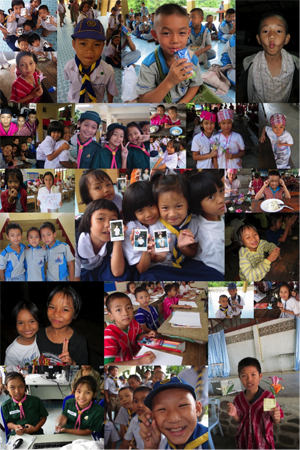 In Morocco, Burkina Faso and Cambodia, we have partnered with grassroots NGOs with proven success records to support their scholarship programs that are in line with our approach and philosophy, and thereby reach out to more children in need leveraging on our partnerships while minimizing costs. All scholarship programs are closely monitored, and we track Key Performance Indicators such as Retention rate and Pass rate of students, Rate of absence of teachers, as well as Teacher student ratios and number of students that complete high school and professional school studies. In all these indicators, our projects have delivered well above the national average. We also monitor the level of education and help improve the quality of education through various strategies including teacher training and supplementation of teachers. 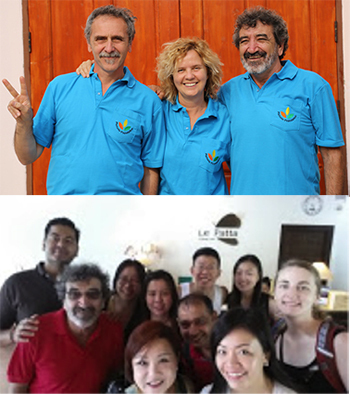 Since our launch, the Foundation has been able to keep administrative, marketing, and fundraising activities at Geneva headquarters and in volunteer Chapters of Italy and Singapore volunteer based, hence we have been able to devolve all donations received directly to our projects on location. Burkina Faso: Secondary school classroom expansions and electric and water system. 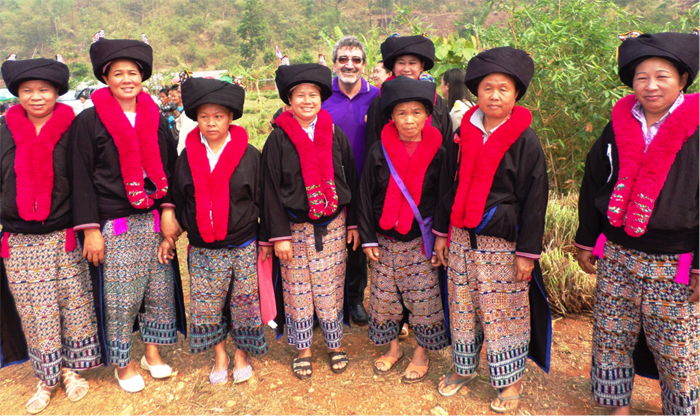 The Chiang Rai Village Project is our flagship project and its aim is to increase the enrollment rate and access to quality education of hill-tribe minorities while assisting communities and villages to become self-sustainable through agriculture programs. 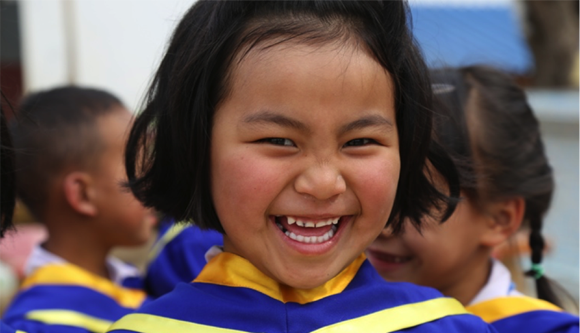 According to UNICEF, the challenges faced by Hill-Tribe children include access to education, trafficking, child labor, poverty, stunting, malnutrition, and exposure to drug and alcohol use. Although the government is responsible for the provision of education to all Thai people, educational provision is not always effective and hill tribe students are subject to high levels of school withdrawal and poor academic performance. The quality of education is a major issue of concern nationwide, and the level is further compromised in rural areas and in the less privileged northeast regions, where a shortage of qualified teachers is common. Enrollment in school for hill-tribe children who lack citizenship represents the beginning of a formal process to becoming a Thai citizen: with a student card they are able to travel and initiate the application process for citizenship. Hill tribe families often lack the financial resources to provide for their children’s secondary school education. The Project supports ethnic minority children’s education from impoverished hill-tribe villages from Kindergarten to Professional School, while promoting the village’s sustainable development by improving access to health and sanitation and promoting income generating activities of families through agriculture. The aim is for families to be able to support their own children’s education in the medium term. The Foundation currently supports the education of over 1,400 hill-tribe children and we have completed over 30 school infrastructure projects, including primary and secondary schools, kindergartens and preschools, teacher accommodations, dormitories, libraries, computer rooms, sanitation facilities, kitchens, canteens, sports fields, and playgrounds. We have also provided 3 clean water systems and 1 health post. Once we build a school, we maintain close relationship with school staff, beneficiaries and the village community to monitor the level of education of the school, oversee beneficiaries’ academic progress, and identify problem areas that need to be addressed. Our staff meets regularly during the year with all stakeholders and keeps track of key performance indicators such as Teacher absentee rate, Student pass rate, Retention rate, and Student Teacher Ratio. In some villages we have built dormitories to allow students from very small neighboring villages to access the school, when daily commuting is not possible. When possible, we provide daily transportation to school to students. At the same time, we work with village representatives and the community to identify the village urgent needs including access to water and health care. This is fundamental to our bottom up approach. Villagers are involved also in construction projects, helping for example in manual work, and in maintenance of buildings and projects. We work the families most in need to implement agricultural projects and with schools to set up School Gardens. Since the launch of our project in 2006, we are heartened to witness the incredible progress of the villages we support. There is now 100% enrollment in these villages, 284 students from these villages have completed Professional School, and all the villages have access to clean water and sanitation facilities in school. The level of nutrition has dramatically improved thanks to the village school canteen and the incidence of common ailments and diseases has significantly decreased. Over 90% of families are now above the poverty line and we are slowly reducing our support and focusing more on improving the quality of education in schools and increasing sustainable community agricultural activities. The standard of living in all the villages we support has substantially improved. Our aim is to replicate and scale the village project to more villages in need. During 2015, significant progress has been made on several fronts in the Chiang Rai Village Project. Among the actions we have undertaken is a continuous effort to improve the level of education in schools by increasing focus on the teaching of English language, by providing teacher trainings at the kindergarten level to improve students’ preparation for Primary School, and by ensuring adequate number of teachers per grade level. We have also completed the construction of Health Post in one of the fifteen villages we support and have also promoted several agriculture and School Garden Projects to help families and schools produce their own food supply and sell parts of the produce to raise their income level. Below are the outlined the highlights of the year. 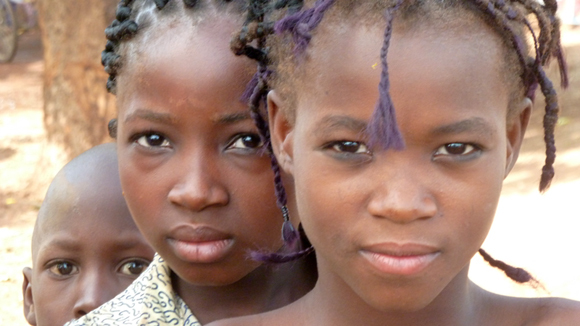 Our scholarship program currently supports 1,419 underprivileged hill-tribe minority students from 15 villages. The scholarship provides transportation to school, school supplies, uniforms, meals in school, and medical assistance for these children. We also supply soap, toothbrushes, and towels to children. 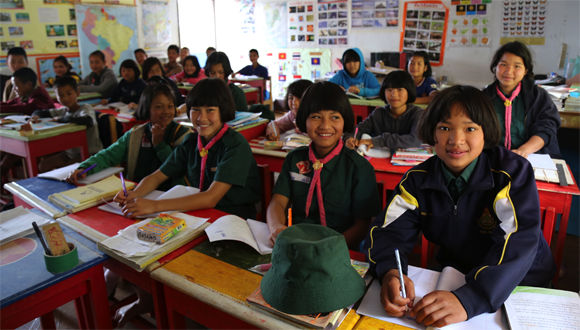 As the government is increasing steadily in the past years its support to hill-tribe populations, we have decreased accordingly our funding, assisting students to benefit from government aid, and contributing what is not provided by the government such as secondary school students school meals (primary schools are provided meals by the government), and sports uniforms (other uniforms are provided by the government). During the year, we have provided meals to 346 students, distributed uniforms to 644 students, and provided transportation to school to 411 students. In March, the end of the Thai academic year, 44 students have successfully completed their Professional School diploma and we are supporting one student in university. Students have obtained diplomas in Tourism and Hospitality, Mechanics, Accounting, Agriculture, and Information Technology, among others. During their schooling students also complete a six-month internship that can also help them subsequently find a job. 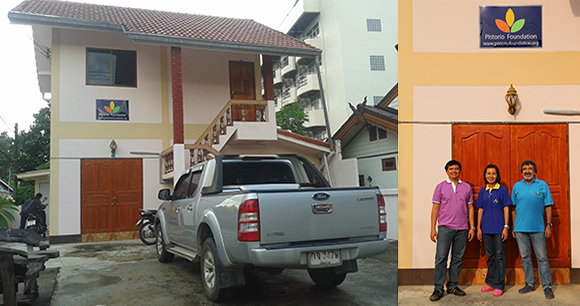 We have built a number of dormitories in Chiang Rai where students can stay while attending school. The Dormitories are equipped with kitchen and canteen, sports field, and computer room. 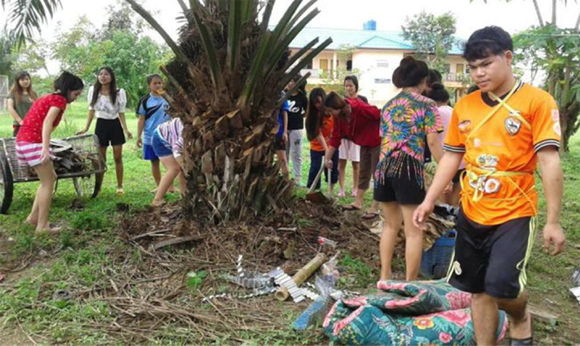 In 2015, thanks to the support of generous donors including Jamie Buitelaar and Family, the Tan Chin Tuan Foundation, and the Universita’ della Terza Eta’ of Trento, we have completed a Health Post at the village of Huay Kuk. 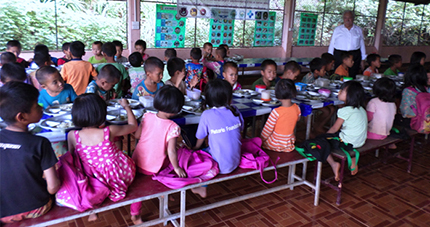 The Health Post serves 872 hill-tribe people, of which 500 from the village of Huay Kuk where the Foundation has already built a primary school, kindergarten, teacher accommodations and dormitory. The Post will have two full time nurses supplied by the District Hospital, which is 15 km away. The nurses will be responsible for visiting patients, conducting health screenings, distributing free of charge basic medication, coordinating the medical visits by doctors from the District Hospital, referring when needed patients to the District Hospital, and keeping a medical record of village patients. The Project was realized in partnership with the local authorities to improve the health conditions of villagers. During the year we help renovate and upgrade when necessary the kindergartens and preschools facilities of villages we support. These schools all have sanitation facilities, kitchens and canteens. This year, we renovated sanitation facilities in one preschool and replaced the furniture and water filter in another village preschool. Our strategy to help improve the quality of education is to focus on teacher training starting from Kindergarten to ensure the success of students in Primary School; provide supplementary English classes to students; supplement teachers in villages where there are shortages of qualified teachers; increase the computers in schools and train and encourage teachers and students to make use of computers, the internet, and distance learning; and promote School Garden activities to engage students in learning new skills and educate them on the environment. For these activities we partner also with other local NGOs with specific expertise in this field. We have partnered with Khom Loy Development Foundation, an organization based in Chiang Rai, to provide training to two of our kindergarten teachers. The objective of the training was to introduce the principles of Montessori Method which has been known around the world by early childhood professionals and parents. The Montessori approach is designed to support the natural development of children in a well-prepared environment. Two of our teachers, Ms. Ajchara and Ms.Thidarath, from Doi Chang and Ban Mai Pattana Kindergartens to participate in this training. Six Kindergarten teachers also took part in a teacher training program in our offices in Chiang Rai. The training program is part of pilot project that is being rolled out by the government to improve the level of preschool education. This training was led by one of our Kindergarten teachers and was an opportunity for teachers to learn more skills and share best practices. We believe that the teaching of English should be a priority for our students, as they will be more competitive on the job market, considering also the importance of the industry of tourism in Thailand. We are pleased that this has also been acknowledged by the government which has announced its intention to enforce the instruction of English nationwide. In 2015 we conducted a pilot project at the Professional school of VBAC involving a native English speaking teacher to 10 of our beneficiaries (in Thailand, English teachers are Thai and not native speakers). Owing to the positive results obtained and the level of enthusiasm, engagement and learning demonstrated by students, we intend to extend this program to many more beneficiaries at the professional school level. We are partnering with Association English Project Trust to enlist volunteers to deliver English classes to our students in Professional School and in two of our Primary Schools next year. The objectives of school gardens are to produce food that can be used at the school canteen to increase self-sufficiency of the village school; to integrate agricultural activities in the school curriculum and provide hands on learning opportunities for students; to foster responsibility and independence in students that are involved in maintaining the project; to earn income by selling the extra produce that can be used by the school for future projects. 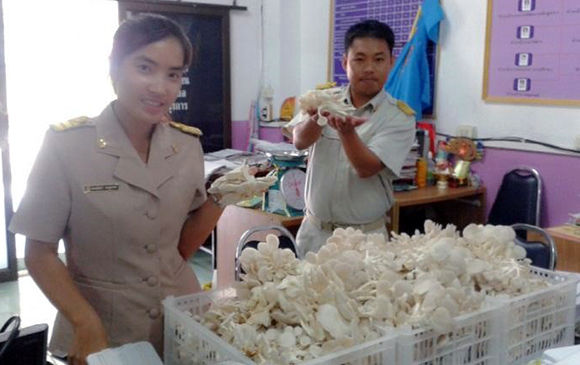 The mushroom project at the Huai Nam Khun Primary School was set up early in the year. 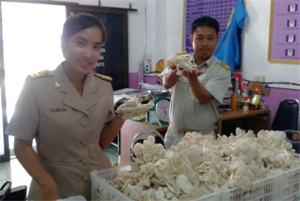 The students are now able to harvest 5-10 kg per day of mushrooms. Thanks to the generous donation of Intel Singapore of 10 laptop computers and of 1000SGD, as part of a fundraising initiative in memory of late colleague Uday Marthy, Intel Vice President in Singapore, a new Computer Lab at the VBAC Professional School Campus Dormitory in Chiang Rai has been inaugurated. The Computer Lab was used by Intel volunteers in September during their mission in Chiang Rai to impart IT and English lessons to Professional School Students. During the year, the Lab will allow students to better organize their work, to use the internet for research, and to improve their IT and English language skills. Our new database system, created on a pro bono basis by Patrice Palmero, intended to digitalize our beneficiaries’ files and village files information, is now operational. We have trained Professional School students to volunteer in our yearly task of collecting beneficiary data and entering them into our system. Our database will allow us to track more easily indicators on progress of students and hence improve our interventions. We have had two volunteer missions during the year. Francesca Ferrari and Paolo Bertolani in the beginning of the year visited schools conducting interviews to school staff and beneficiaries, and documented projects through videos, photos, and written accounts. Francesca Ferrari has produced several short documentary films which are available on our website. In October, a volunteer team of nine professionals from Singapore led full immersion English and IT Lessons and Workshops in Primary, Secondary and Professional Schools. In addition, the wonderful team composed also of Intel staff members, raised 15,000 SGD for our Scholarship Program, and raised awareness on our projects amongst their colleagues and community. 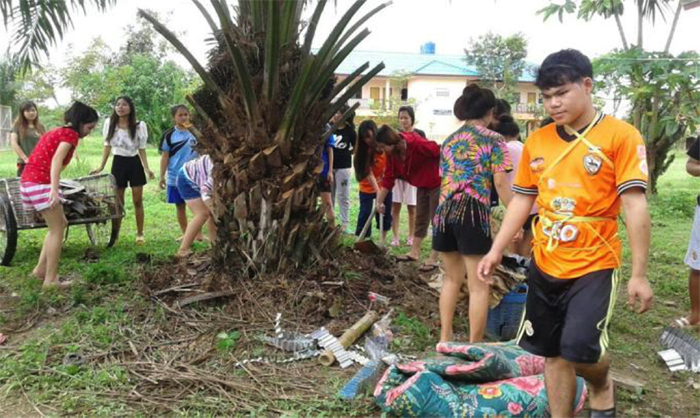 “…This is the second mission trip for Singapore volunteers to Pistorio Foundation projects in Thailand. During the 5 days that we were there, we taught students from the primary, secondary and professional school, which are supported by Pistorio Foundation. We played games, taught English and Geography, and had art lessons for the primary and secondary school students. We witnessed how the donations from Pistorio Foundation helped these young children fulfill and progress to their ambition in life. Even though there were language barriers among us, but the smile and the warmth the students gave to us demonstrated their appreciation in a big way. Prior to the trip, the team had to spend many evenings to organizing age appropriate lesson plans, detailing fun filled as well as educational activities to the beneficiaries which resulted in a very successful English and IT missionary trip run by volunteers. It is amazing to see the children participate enthusiastically with high level of energy. There was lots of fun while learning but the kids were diligent on getting their assignments completed and handed in after every lesson. We were completely drained by the end of each day, as we ran from class to class in the day and spent our late evening planning for lessons for the next day. However, our effort paid off when we see how the children progress. In line with our philosophy of involving beneficiaries and their families in projects from the identification of needs to the definition, implementation and maintenance, during the school holidays students in Professional School in Chiang Rai as well as students in numerous villages, were involved in painting school walls, upgrading school gardens, and in the up keeping of dormitories. The Foundation is registered in Thailand where we operate with a staff of three: country Manager Giovanni Santavicca and two program managers. We involve the village community in project works and leverage on the work of volunteers to keep overhead costs low. ChatChai ChurMue is a 22-year-old second year student of Industrial Engineering at RajaMangkala University of Technology Lanna (RMUTL), in Chiang Rai. He was born in the small village of Abodo on the mountains, about 65 km from Mae Suai District. ChatChai is from an Akha tribe family, originally from Myanmar. His parents are farmers, as the majority of villagers. They grow enough rice to feed the family, but never enough to sell. 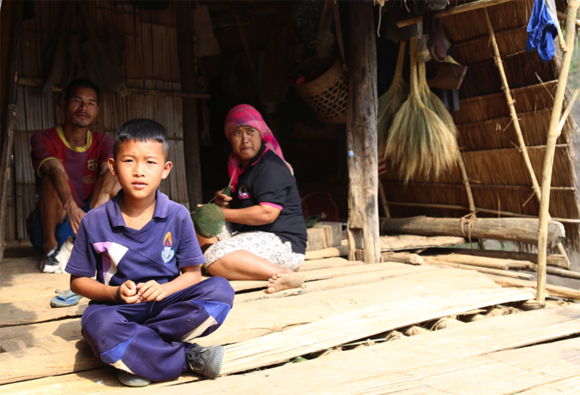 As such ChatChai’s family could not afford to pay for his schooling. Since 2006, in partnership with CIAI, the Foundation has supported the education of 119 underprivileged students from the rural western province of Boulkiemde’, supplying school materials, uniforms, school meals, and basic health care, as well as micronutrients, vitamin supplements, anti-parasite medication, soap, and hygiene training. Students are also provided with bicycles to travel to school. 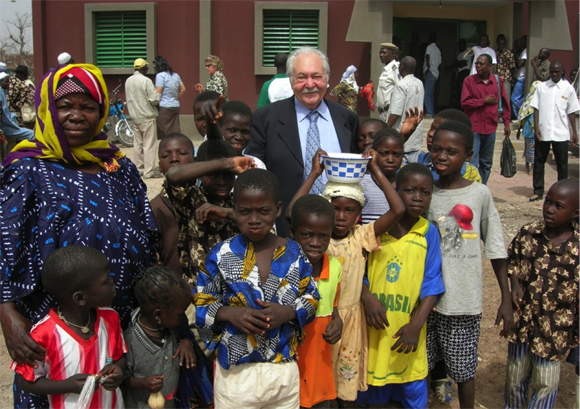 The Foundation completed several major infrastructure projects including the expansion of a primary school in 2007 (sanitation facilities, canteen, kitchen, and extra classrooms) in the village of Nibagdo, and a very large Secondary School in the nearby village of Sogpelce’, which now holds over 700 students. In 2015, the Foundation contributed to the expansion of the Secondary school with three new classrooms, funded by the Foundation along with other local partners, and the electric and water system was also completed. 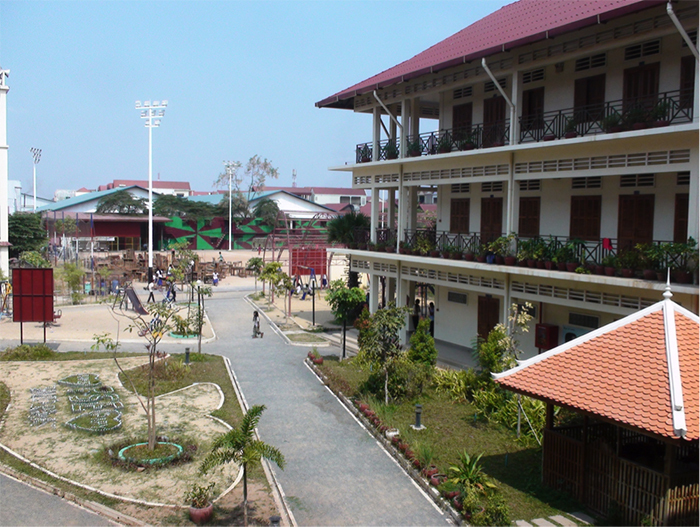 The secondary school now consists of 10 classrooms, administration offices, library, reading room, computer room, and director’s lodging. Our secondary school is considered the best in western Burkina owing to the high quality of education, the low student teacher ratio (53 as opposted to 60 nationwide), and the quality facilities that have contributed to attract top level school staff. Scholarships also help fund micro credit programs to provide income generating opportunities to families of beneficiaries, including preparation and sale of meals, eggs, sprouted millet, cereals, corn flour, and hand woven handicrafts, among others. 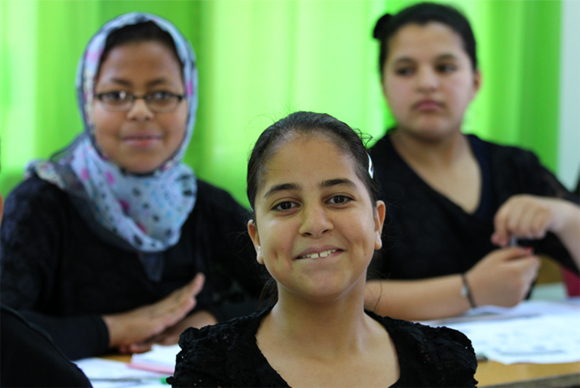 The Moroccan education system still faces high drop-out rates, especially in the rural areas. Less than 15 percent of first grade students are likely to graduate from high school, also due to low levels of daily attendance, teacher absenteeism, and a multi-lingual environment at school. The Foundation has partnered with the Ministry of Education and the Azrou Center for Community Development to tackle this problem, by helping drop out students reintegrate into the school system through the government’s Non Formal Education Program. The Program provides “catch up” schooling in all formal school subjects so that two years are taught in one. The aim is to re-enroll beneficiaries into the public school system after two to three years of ENF Program. At the same time, students are introduced to vocational training classes of their choice, including woodcarving, hairstyling, embroidery, electrician, or IT. This also gives the chance for older students to learn vocational skills and be admitted directly to public Professional School. In addition, students can do internships in local businesses while enrolled in the Program. Since the launch of the program in 2011, seventeen beneficiaries have already successfully completed Professional School and our now working. 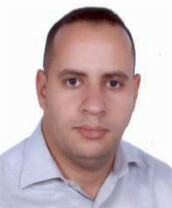 The Moroccan Minister of Education has cited our center as the most successful in Morocco in running the ENF Program. In 2013, the Foundation built a school at our partner’s premises, the Azrou Center, entirely dedicated to running the ENF Program. The building consists of classrooms, workshop rooms, sanitation facilities, kitchen and canteen. Students’ Scholarships cover teachers’ salaries, meals in school, backpack, school supplies, cooking staff, trainers, field trips, sports and cultural events, and general running costs of program. Beneficiaries receive one meal in school and basic health care. During the year, through dedicated workshops, students learn about dental care, basic hygiene, nutrition, environmental protection, issues concerning smoking, drug use, Aids, violence, and children’s rights issues. Children also take part in visual arts, theater, music and sports activities. Extracurricular activities and field trips are meant to strengthen the beneficiaries’ self-esteem, build strong relationships with other classmates, and improve retention rate. For many, the field trips with the school represent their first and only opportunities to travel and sight see. The quality of education provided at the Program is of very high standard, with low student/teacher ratio at 20:1 compared 40:1 in public schools and extremely low absentee rate (less than 5 days a year). Teachers are able to create a very positive and nurturing environment, tailored to the needs of individual students, to help them succeed in school. Mothers of beneficiaries may attend literacy, numeracy and vocational training classes at our partner’s Azrou Center, to improve their income generating capabilities, and can also access health care screenings. Mothers are invited to the Center’s Family Planning Counseling sessions several times during the year during the medical campaigns. Hatim’s father died when he was only one years old. He and his six siblings were raised by his mother. He dropped out of Primary school because of poor academic performance and a desire to work to help his mother financially. 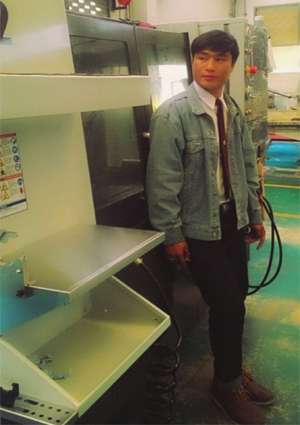 He worked as an apprentice mechanic for three years, until he learned about the ENF program, and decided to enroll. 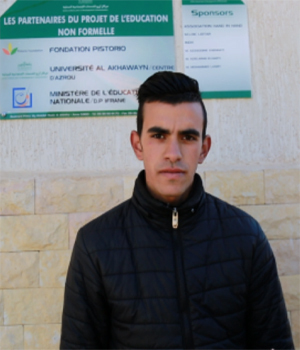 Hatim passed his primary school exam and went on to obtain a Professional School Diploma. Hatim can now aspire to a better future. After completing the ENF program, we have continued to support his studies and school supplies, and provided moral support and encouragement to continue his path to become a successful and active member of society. My name is HATIM. I studied at IMAM ALI primary school for 4 years before dropping out of school. Fortunately, our neighbor is a teacher at the Azrou Center and she told me about the center, so I joined the center in 2010. I studied for 2 years before taking the primary school exam and I succeeded. With this I was able to enroll in the vocational training school for Wood Carpentry, where I studied for one year and earned a Certificate of Specialization in 2014. I registered for a second year and also succeeded in 2015, obtaining a Certificate of Qualification in Aluminum & Wood Carpentry. 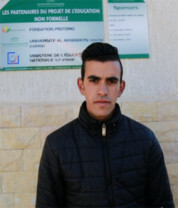 I am happy with this Diploma because it has given me a lot of opportunities, I will be able to either work or register for additional classes in Meknes to become a specialized technician. Since 2006, the Pistorio Foundation has supported 183 students enrolled in Pour un Sourire d’Enfant (PSE) schools. Students that have been out of school for many years are able to enroll in a fast paced “catch up” program that allows them to cover two academic years in one. In six years, they can complete twelve years of education. In addition, PSE offers dozens of onsite Professional School and Vocational training, including in Tailoring, Baking and Pastry Making, Gardening, Housekeeping, Childcare, Hair Styling and Spa, Plumbing, F&B, Masonry, Hotel Management, Accounting, and Cooking. 90 students we have been supporting have already completed a Vocational Diploma and our now working, earning many time more than their parents, and able to support themselves as well as their family of origin. All students come from destitute families in the poorest areas of Phnom Penh. Most are broken families with several children in the household, living in makeshift shacks, with no access to water, electricity nor sanitation facility in the home, and yet struggling to pay for rent, health care, and often facing insurmountable indebtedness to loan sharks. 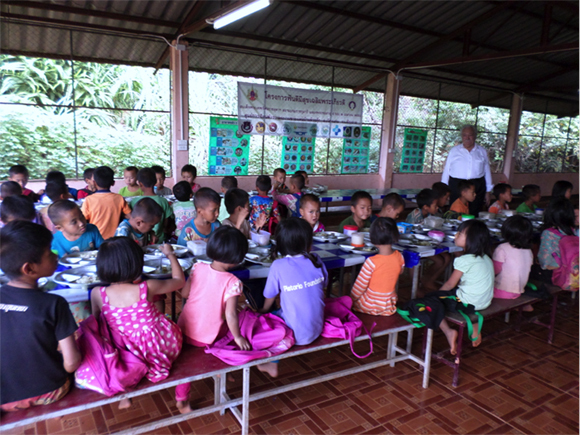 At the PSE center, children from the slums are able to have breakfast and wash before joining the classroom. The scholarship covers the following: school uniforms, supplies, three meals in school (breakfast, lunch, and snack), toiletries, basic health care, teacher salaries, social workers’ salaries, and a ratio of rice given to families to deter them from sending the child to work. Currently, she shares a one room flat with her brother and mother. In one room they cook, sleep and study, and use a very tiny bathroom to hand wash clothes. Thida is in her second year of Accounting at the Business School of PSE and once she completes her five-year program she will have a Bachelor’s equivalent. The Business School is one of the recent additions of Higher Education Schools at PSE. 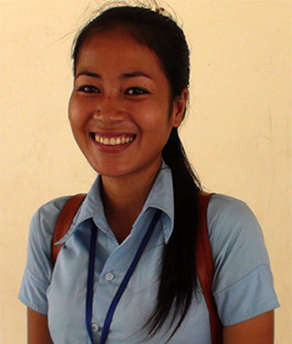 Obtaining a degree will represent an opportunity for Thida to change her future and her family’s life. They benefit from a monthly ratio of rice without which they would not be able to afford sufficient food for the family. As a factory worker, the mother earns 130$ a month, of which 50$ goes to pay for rent and 28$ for electricity. Thida is an exemplary and bright student with lots of enthusiasm and dedication. Thida posing with her brother in front of their home. They rent a room on the second floor where they live with their mother. 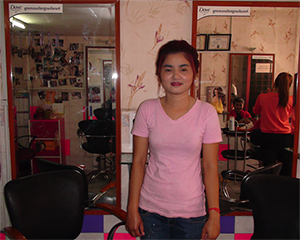 Sitha has successfully completed the PSE catch up Program and the Hair and Spa Vocational Program. This has allowed her to find a job in the city as hairstylist where she currently works. Sitha now earns between 150-200 $ a month depending on the tips, many times more than her mother. 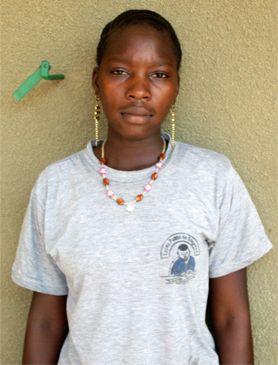 She is now able to support herself and help out her family as well. In 2015, the Singapore Chapter hit the ground running with a celebratory opening: the Foundation’s 10 year Anniversary Charity Gala Dinner. Throughout the year there have been volunteers actively fundraising and travelling to our projects in Thailand contributing time and skills, and raising awareness on our cause. Overall, the volunteer Singapore Chapter managed to raise 84,649 SGD, 100% of has been devolved directly to fund scholarship programs in Thailand for underprivileged hill-tribe minorities. Our infinite gratitude goes out to our tireless team of volunteers who every year continue to devote talent and time to help children in need. Our 10 year Anniversary Charity Dinner was held at the enchanting Alkaff Mansion Ristorante, featuring delectable Italian specialties prepared by Chef Simone Depalmas for over 100 distinguished guests. 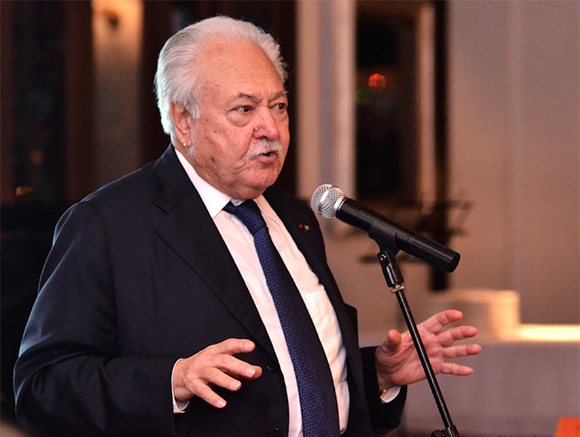 The event was hosted by fashion journalist Rana Wehbe and presided by Pasquale Pistorio. Guests learned about the recent progress of the Foundation while enjoying an evening of live music with world class mezzo soprano Angela Hodgins and internationally renowned pianist Kseniia Vohkmianina. Special thanks to Singapore Chapter President Marzena Hugues for coordinating and organizing the wonderful event, and to all the volunteers, sponsors and supporters who helped make this a great success. In particular, we would like to thank sponsors Lombard Odier, Virtus Capital, XID Technologies, MasterCard, STMicroelectronics, Alfero Gelato, Alkaff Mansion, Autium, Autoctonous Wines, Duepunti, FBI Wines, Missoni, Peachy Pixx, Rosso Prezioso, Small Luxury Hotels of the World, Singapore Tatler, System Sovereign, and Queenmark. The event was featured in the May edition of Singapore Tatler, available on our website. Founder of Three Sixty Skills, Anh Thu Nguyen is kindly donating 10% of proceeds from the sales of her book, Master the Art of Life, to the Foundation. More information on the book and how to purchase a copy is on the website, www.threesixtyskills.